Picture this – you’re in the grocery store and your healthy chocolate chip cookie recipe calls for pure vanilla extract but you’re trying to save money on groceries and the imitation vanilla is much cheaper. What do you do? Good news. You never have to choose between pure vanilla extract and imitation vanilla extract again. By following this simple recipe, you will learn to make your own homemade pure vanilla extract for less than the cost of the store bought imitation. 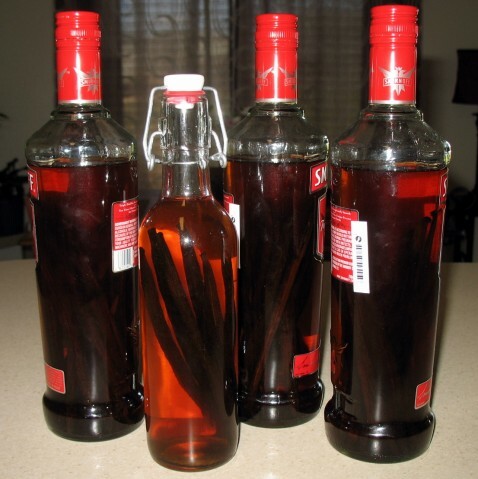 Making homemade vanilla extract is easy and cost effective. 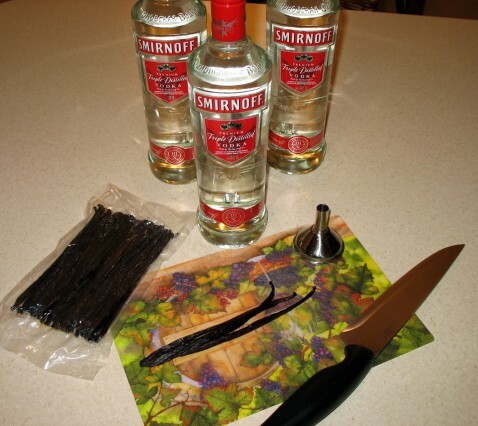 Using the funnel, remove approximately ½ cup of vodka from each bottle to make room for the vanilla beans. Using your cutting board and knife, slice each vanilla bean lengthwise along one entire side of the bean. Place the beans in the vodka bottle, replace the lid, and shake. Store the vanilla for 2-3 months in a cool, dark place. Shake the vanilla once per week to agitate the beans and speed the extraction process. One 2-ounce bottle of store brand pure vanilla extract cost $4.99. Total cost = $2.50/ounce. Three bottles of vodka (“a fifth” or 750ml) cost $10 each for a total of $30. 750ml x 3 = 2250ml which is equivalent to 76 ounces. ¼ lb of vanilla beans (approximately 36 beans) is equivalent to 4 ounces and cost $10. Based on these calculations, 76 ounces of pure vanilla extract cost $40. Total cost = $0.50/ounce. Imitation vanilla costs approximately $1.00/ounce. This reveals that homemade vanilla extract is 5 times cheaper than store bought pure vanilla and twice as cheap as imitation vanilla. Based on the ease and savings of this project, making homemade vanilla extract is a great way to save money and be sure you’re getting a high quality product! Thank you very much. I do have one more question. Can you use amber plastic bottles. We always advise folks to steer clear of plastic. Glass is a much safer, more natural storage method. Where do you buy the 2oz bottles? You can buy glass bottles of all sizes here. Can you do this with Lemon, Orange, nutmeg, etc? Yeah, all extracts are made pretty much the same way, with alcohol. Hey just found this site and hope you can help. I have a batch about 6 weeks out and it has now turned cloudy. Is it still good? the other two bottles I started at the same time are clear. Did I do something wrong? I used beans from a different source for that bottle than the other two–could that be the issue? This is typically caused by over-processing the beans (cutting up too much or grinding) or using low quality liquor. Blessings. Based on my research it is, but I cannot be sure so my advice is to start over with that batch. If the vanilla lasts only 2-3 months, why would you make so much at one time. I would never use that much in that length of time. It lasts for years, it takes 2-3 months to make. I think I cut the whole bean lengthwise and cut into the bean itself. 🙁 So I am only supposed to cut the outside peel per say? @ Jeremy – I cut into the whole bean lengthwise – not in half completely – but I know I cut inside the bean itself as well – I have had no issues – you’re good, no worries- make sure to shake the bottles though to help it along in the process. I am about a month into the process and I notice there are vanilla droppings at the bottom, looks like part of the inside bean. Obviously these wont look pretty as Christmas gifts so I am going to strain them out with cheesecloth. Have I done something wrong? @ Jeremy – Nothing done wrong – there will be some of that during the process, just pieces of vanilla bean. Straining will be ok. I am three days away from my first batch being done and it’s amazing to watch it. (I did actually use some for pie on Thanksgiving and it was fine – my in-laws didn’t know I made it and when they sniffed it said, “it’s vanilla extract, why are you asking” lol. Hi, I just saw this and am very eager to try it. I just have a few questions so I don’t screw it up. How many beans do you put into each bottle of vodka? Also, how long exactly should it sit before it’s considered “done” where you can transfer it to a little bottle? Where do you find the extra bottle you used for the extra vodka? Thanks so much! I’m so excited to have found this. Glad you found us Rachel, give it a shot, you’ll love it. 12 beans per 750ml. 2-3 months should do it. The extra bottle was a gift from a friend, not sure where it came from. My vanilla extract is very alcohol smelling. When I use it in my homemade coffee creamer I can taste the vodka at times. Does this mean that my beans no longer have flavor? Hi Heather. How long did you let the beans steep? Flavor extracts are made this way (by letting alcohol extract the flavors over time) so they will have a high alcohol content (just like store bought extracts). I would say just cut back on the amount you’re using in your coffee if the alcohol taste is too strong. Blessings. The beans have been steeping for about 8-9 months. I saw on one of your other posts that you should use about 12 beans. I only have about 6, so I’m guessing that’s my problem. Yeah, 12 beans works great, but I can’t vouch for six. Hi! is it a problem if the vanilla bean floats a little bit on the top of the liquid? It has contact with the air that separates the liquido from the cork. Thanks!! No, but I would flip it over once every week. How would one make perhaps maple extract? do you remove the bean after a year or so? I was going to use rum instead of vodka because we already have some in the cabinet, but do you think dark rum is ok? Or should I open the new bottle of clear rum? Also, the clear Bacardi rum is in a plastic bottle. Will that be a problem? Just did my first 2 bottles of this – can’t wait to give this out as Christmas gifts! Thanks so much for sharing such a great thing! You guys are truly wonderful people! BTW, purchased your book – LOVE IT!!!! Keep up the great work! God bless! Thanks for your support Julie! Blessings. I have a bottle of established extract, that I need to top off with alcohol. I started it with vodka, but am out. Could I switch to rum, or would that throw off the flavors? Great idea, but it’s a LOT of vanilla extract for me. If we’re going for inexpensive, I’ve found that buying the extract at Costco is even cheaper than making it. It is a lot of vanilla extract lol. I did some comps with the Costco in my area since my mom challenged it and actually, cheaper for me to make it than buy it. I would assume it depends on your location and also what vodka and beans you purchase. Cheap vodka is all that’s needed, I just used Aristocrat, $6 a bottle for me in my area. I also received a great deal on the beans through DIY’s recommendation, and the beans seeped in your first batch can be reused to make another batch. It has a long shelf life and you can distribute as gifts to friends if they are into baking and such. Use it in coffee creamer or hot cocoa. You can also use some beans in some oil to make vanilla oil which is really yummy in baked goods instead of regular oil. We literally bake every day in December to the All Recipes Christmas Cookie Countdown so mine will definitely be put to use. It’s a fun thing to watch – my kids get excited to shake the bottles and we’ve taken pictures to watch it transform – it’s a nifty little science experiment. i havent shaken up the bottles, its almost like i dont have anymore energy to walk over to the cupboard now. Do you put all 12 beans in one bottle? What is the ratio of bean to Smirnoff Vodka bottle, just to clarify? This recipe calls for 12-ish beans in 750ml bottle of vodka. I’m SO happy to have found this site. Thank you everyone! I have lemon and orange trees. I’ll be making ALL of the above as Christmas presents. I think I’ll make “samplers” using the mini alcohol bottles. Where can I buy fair priced vanilla beans to make my own extract? I want to make this for Christmas gifts.Thanks! The reason to choose between imitation and pure vanilla extract is the addition of heat. Heat boils off many of pure vanilla’s subtle flavors, leaving only vanillin, ultimately wasting money without adding flavor. So the rule is, if you are cooking or baking, use imitation, if you are not cooking use pure or your excellent homemade. Hi and bless you for your great information on how to make vanilla. I started mine about 3 weeks ago in a very large bottle. Using 3 beans for every cup of Vodka and I just received my brown 4 oz. bottles in the mail. How many beans do I need to transfer to the small bottles to keep continuing to brew? Do you think I should transfer it already? Also, we aren’t drinkers so my husband made me go into the liquor store for the Vodka! 🙂 That felt really strange! I would let it finish brewing in the large bottle, then you can transfer it to the small bottles with no beans, or including 1 bean in each for the cool look. I have been making my own for about the last 4 yrs using brandy instead of vodka. Would never go back to the shop brought stuff. I do it in smaller 200ml bottles with 4 beans slit lengthwise and cut smaller. I leave the beans in the bottle and use the extract then add more beans and more brandy. I also use the brandy beans in cooking sauces etc and mince them up for pavalova or custards. Stupidly I bragged to friends and family about my yummy vanilla, and I now have to make quite a quantity just to give away as gifts. Have 4 regulars for Xmas. Because this is in alcohol it will keep indefinitely if capped securely and the cap kept clean. Mine is just kept in the cupboard and not in the fridge. Never had any problems with it. To see the shelf life I would look on the labels for pure vanilla extract on store shelves, this stuff would be about the same because it’s the same thing. We have been using ours successfully for years now – same batch. Ok great! I want to do this for Christmas gifts as well and would want to put that on the label. Thank you! Just wondering, do you have to use corked bottles? I would like to use screw top. Awesome, thanks for the quick response! Love this site! Thank you soooo much for sharing. God bless! Hey all, I was wondering if anyone ever had mold grow on the inside of your bottles? I have 3 bottles going now that are all about 10 weeks. I noticed on one of the bottles near the neck of the bottle (where there is no vanilla) there is some yellowish residue – which I think may be mold but I’m not sure since I can’t imagine anything growing in a bottle of vodka. Thoughts? Have you been shaking them a couple times each week? Even if you haven’t I can’t imagine mold growing in there, it’s basically vodka. I always give homemade gifts for Christmas…thank you so much for sharing this…now I know what everyone in my family is getting for Christmas!! Awesome!! Thanks for the site for vanilla beans as well. I priced them in the store the other day…each individual bean sold for something like several dollars. Too rich for my blood! Thank you. Thank you! Yeah buying them this way is the only way to go. You’re welcome Lisa, glad you found us. God bless. Lemon or orange extract can be made the same way. Just add the yellow (or orange) peel to the alcohol (leave out the white pith). I’ve been making homemade vanilla extract for quite awhile, and it works great. I like that I can adjust the intensity of the flavor by using more or less vanilla beans as I see fit. Makes great gifts! How much of the lemon or orange peel should I use to how much alcohol? Thanks. Awesome Sean. This will allow you to always have one is use and another brewing. God bless. Hi!!! Going to give this a try but just want to know if this is safe for the kiddos, I know alcohol burns off whens its cooked but Im very conscious using it in recipes when my babies will be eating too!! LOL sorry might be silly but rather be safe then sorry!! thank you!! Hi Kim, this vanilla extract is the same thing as you purchase in the store. A tsp in baked goods is safe. Hey Matt, ive come to a standstill, the wine bottle cork has broken up and is in the vanilla bottle…. is that a problem, would i need to drain it remove the cork and put back the extract? is leaving the cork in there a good or bad idea. my friend said it could add a woody flavor to the extract ! PANIC MODE ! theres red lights flashing in my head. Help me out ! I would leave it. If you want to bother, dump the vanilla into another bottle (thru a filter if you want), then transfer the vanilla beans. Sean is right Carrie. Don’t throw out the beans, keep them in the vanilla and just refill w/alcohol when it’s empty. We keep two bottles in rotation so we always have some handy. The beans are not the same strength and may take longer but are still good. Filter if you want, we do not. That’s all vanilla extract is, alcohol and vanilla. My mom spends a fortune on vanilla extract for her “famous” chocolate chip cookies and its always a concern so I told her I would research how to make it ourselves. I have rum and vanilla beans in the pantry so I’m starting right now! Thanks for the information. You have good timing! I started my first batch last week, it is for me and also a bunch of Christmas gifts! Looking forward to baking with it when it it is ready. Coincidentally – I started some orange extract today. Good! Let us know how it turns out, and how exactly you made it. hey Matt, could i uncork the bottle an add in 4 more beans? also here in India you get pure 100% vanilla paste, i have already used a tablespoon sachet its the bean extract and nothing more, i assume that must work too? the first bottle is a mere try out, will be leaving the bottles for about 2 years till full maturity. You can open it and add more beans. We haven’t tried the vanilla paste, but be sure to let us know how it goes. Hi, i have two questions, firstly, is 6beans in 750ml of vodka alright? whats the shelf life of the homemade extract? i just started with my first bottle, i plan on atleast making 5more bottles. 6 beans should work, but it will take longer. The shelf life is the same as a bottle of vodka – years and years. Hi All, One of my dear friends, an 83 year old pastor’s wife, has been doing this for years. I bought organic vanilla beans at EarthFare for cheap – $3-4.00? It wasn’t much at all. I purchased my Vodka – haven’t been in a liquor store for 23 years 🙂 and am on the road to making my first vanilla. A few weeks later it dawned on me that I didn’t use ORGANIC VODKA!! I do everything possible organic. I think alot of vodka is from GMO grains. Beware!! They make organic vodka – just search online. I found a store down the street from me that sells it. So, I’ll give away my precious vanilla that is almost ready and do the organic stuff instead. I know recipes don’t call for much vanilla, but why spoil them when you use organic ingredients and blow it on the vanilla! Love your site, just stumbled on it today!! Thanks Matt & Betsy and may the Lord bless you both!! Thanks Peggy, glad you found us. God bless you too. I must say that you have inspired me to want to see how many things can be homemade to decrease my carbon foot print and make life just a little bit easier is these hard financial times. Thank you for the site and that great book is there more volumes to possibly follow? Does it matter what type of vodka? I have Skyy and Absolut Vanilla. I was going to try the Absolut but was wondering if the imitation flavor mixed with the pure flavor would muttle things? You can try flavored vodka if you want but I’m pretty sure they have less alcohol. If it were me, I wouldn’t do it, but it’s up to you… that’s the great thing about DIY. So, from the day you put the beans in the vodka, it’ll be approx 3 months until it is usable extract, right? My project is developing a “cream” like substance in the alcohol. I presume this is the water from the vanilla beans. I did not use Grade B beans. I purchased the higher grade before I realized the only difference in the grades was moisture content. Will the straining process at the end of my six months remove the “cream”? I believe this is the same thing Mana is talking about. I am unsure what to tell you since we never experienced this and I cannot find any instances or explanations when researching. If it were mine I would either get it tested (local extension office) or toss it and start over. Recipe makes such a large bottle . . . how long until it will expire? Thanks to its high alcohol content, just like store-bought vanilla, it has a shelf life of many, many years. I’ve heard of doing this, but always wondered what in the world I would do with so much vanilla extract! I like the idea of giving it away as a gift! would this extract be ok to use in homemade vanilla coffee creamer? you only use about 2tsp, but i wasn’t sure about the alcohol since you aren’t cooking with it. You can use this just as you would store bought vanilla extract. We did not experience this Mana, and we’re still using our original vanilla beans from 2 years ago. Not sure what to tell you here… but be careful. Perhaps you could take it to your county extension office for testing. Great! Thanks Matt – I am a very happy woman with a LOT of useable vanilla extract to get on and use! @Jenny – it’s mainly just ‘alcohol’ smell with a touch of vanilla though still. I shall be using it from today. What a WONDERFUL site! I came upon it by accident and have bookmarked it. Thank you so much for sharing all these helpful tips for doing more for ourselves. I make my own bread and my own laundry detergent already, but never even thought of most of these things! I think I’ll start implementing your ideas one at a time. Awesome, glad you found us Elizabeth. God bless. I got my vanilla beans from Amazon and glass bottles. Just got the little bottles for gifts. We did the first round in June. I’m getting ready to pour it into little bottles for Christmas gifts. Caroline, I’m interested to see what Matt has to say about your question. It looks like he has a few questions to answer – must be the holidays. I didn’t think vodka had a smell. I’m going to be sure to shake my new experiment right away! hmmm…my vanilla extract experiment smells VERY strongly of vodka. Is it because I forgot to shake it each week or is it more likely that I just got my measurements totally wrong? Any way of saving it – it’s been sitting there for months or do we have to admit this one lost…? Thanks for the help! Any extract is mostly alcohol, that’s what extracting is… extracting flavor of *whatever* by soaking in alcohol. If you smell vanilla extract from the store it smells the same because it’s exactly the same thing. Use with confidence. Also Matt, how do you split the bean pod without damaging the beans inside? Or does it matter? I’ve never tried it, but those pods look so skinny, I don’t have any confidence in my ability to split them without making a mess and ruining them. And they’re way too expensive to ruin! Just slice them open, you won’t do any damage. Also, I updated the link to the bottles, thanks for alerting me, they changed the link. Here’s the new link. Awesome Pat, glad you’re enjoying your new found DIY adventure, we love it too! I am wondering if you can store this in plastic bottles or do they have to be glass? To give as gifts it is much cheaper to buy plastic amber bottles, but don’t want to compromise quality! Wow, love your site! Do you have a recipe for pure almond extract? I go through this quickly putting it in hot milk to get to sleep and also in my lactose free yogurt. We don’t have a recipe but I can make one up since any extract is the same basic process. Grind up the almonds in a food processor or blender, not into nut butter, but just chopped up finely. Use 6 Tbsp chopped almonds and 2 cups vodka. Store 6-8 weeks and shake once/week. I just mixed up my first batch of almond extract . I have just ordered vanilla beans so that i can make the vanilla extract . I have always wanted to try … Thanks so much for all the information. I was just looking for some homemade laundry soap recipes and found you! Am I ever glad I did. I go through vanilla like it’s going out of style (I use it to bake my dolls, yes you read that right) and now I can make it myself. Thanks for sharing all your recipes! Ha ha, bake dolls? Sounds cool. 🙂 We’re glad you found us too Rena. On my second batch of your recipe for homemade laundry soap…I love it!! Also have had my vanilla extracting for about a month now…it smells absolutely heavenly! I have a question on reusing the vanilla beans and wondered if you’ve ever done this. I went searching on the internet for other vanilla recipes, and some sites suggest reusing the beans. I also found that many use the cheaper Grade B vanilla beans; supposedly, because they’re dried out, it takes less time in the extraction process. You can try it, we haven’t yet because we still have yet to use up our first batch. Let us know what results you have. Laundry detergent…check. Dishwasher detergent…check. Deodorant…check. Rinse agent and fabric softener…check. Castile soap…check. Avoiding three aisles of the grocery store for at least six months…priceless. Vanilla extract – you’re next! I have a quick qustion you may know, or not know the answer, but I am curious. When you buy vanilla, it is usually sold in brown bottles. I know that when we purchase medications, some are in brown bottles to maintain shelf life. Would this be true of home made vanilla too, or should we not be concerned about this? Brown bottles are supposed to increase shelf life. We store ours in the basement, where it is not in direct light, which has the same effect as darkened bottles. You can do either, neither, or both, obviously the more measures you take the longer your shelf life will be. The same is true for olive oils and many other food stuffs. Hope this helps! We used about 12 per bottle (750ml size). Ha ha ha, this made me LOL. I understand one can also make black walnut extract from the soft outter shells & alcohol. Has anyone ever tried this? It is suppose to very healthy. Just curious. This process can be used to make any type of extract, thanks for bringing this point up Sue. God bless. Was curious if this recipe would work the same using peppermint leaves and lemon peel to make peppermint and lemon extracts?? I’m not positive on the time frame, but the process for extraction would definitely be the same, so yeah, go for it! Thanks Matt! I will try these out and repost sme time frames for anyone else who may want t try them. Watching Dr. Oz the other day and he said that dabbing vanilla extract on our skin will keep gnats away. We’re going to try it here to see if it works to keep sand no-see-ums away as well. If we’re lucky maybe it would work to keep mosquitoes away, too? Not sure about that but it’s worth a shot. We use straight citronella to deter mosquitos – works great. We live in Illinois and the Buffalo gnats were awful this year! The only thing that worked was vanilla body sprays or real vanilla dilluted and used in a spray bottle like the body spray. My husband got “ate alive” while I did not and smelled good too! Good luck! I hope this isn’t a stupid question…but if I am using mason jars for this, do I need to sterilize the jars, or is it sufficient to just wash them? Thanks! Cant wait to try this. I do live in an area where you can get cheap vanilla from Mexico but I am definitely going to make my own. It is nice to know more about the products you consume! Wow! Love the site!! And I’m so glad to see a recipe for homemade vanilla extract. It is so much better than the traditional stuff in the stores because it’s not diluted with dark corn syrup! How strong is the vanilla you made now? Does it keep getting stronger? I think it hits a wall after a few months of soaking up the beans but Betsy and I still have ours sitting in the basement waiting to be used. It tastes great. We gave away a ton of bottles at Christmas last year and people love the stuff. I have been wanting to try homemade vanilla extract for a while now, but one big question has been holding me back. Does the raw extract still contain alcohol? I know in most recipes it would be cooked, and the alcohol wouldn’t be an issue, but my favorite frosting recipe is not cooked and calls for vanilla. Would I end up with vodka flavored frosting? Hi Amber. All vanilla contains quite a bit of alcohol, so you won’t have any problems w/this recipe. It will contain alcohol, like the store bought stuff, but it will not make anything taste like vodka. Use with confidence. Thanks, that is exactly what I needed to know! I think I might have to break down and brave it next time we shop! just came across your web site, and its a great idea for the vanilla cause all I use was the one from Mexico, my grandma d goes to mexico every year and we get like 12 bottles if not more, we are hooked on that cuz its the best. so I will try this and see how it goes.. so excited since I have been makeing alot of things as well, we are a family of 5 and well if I can make it and save money at the same time why not!! Oh and the toothpast one will try as well we go threw that like crazy also. We’re glad to help Azeret! God bless. Never tried it Priscilla, be sure to let us know how it goes if you do. I set up a post regarding DIY dish detergent. I have used it in a few loads now, and so far so good! I made sure to post a link back to you so any readers can discover your site! Thanks again. I was looking at eBay to find out the pricing on the vanilla beans, and I wasn’t sure what kind you bought? What’s the difference between Tahitian and Madagascar Bourbon beans? Can I use either? For some reason, the Madagascar seen to be way cheaper. I recently read that vanilla extract is best made with grade B Madagascar beans. They are also known as extract beans. Apparently this is because they have a lower moisture content than that Grade A (gourmet) vanilla beans. There isn’t any need for this moisture in your extract, so the cheaper (yay!) grade B vanilla beans are perfect. Don’t be alarmed when they look a little drier and uglier. Thanks for the info Stacy… where did you read that? I have done this but only with 3 or 4 beans that I didn’t slice. But I did not re-use them to make more vanilla. The vanilla is good. Yours looks like it doesn’t take as long to get a nice strong vanilla! I will try your method next. Also, when I finished a bottle of vanilla, I put my beans in the bottom of my sugar container to get ‘vanilla sugar’ for cookies and such. YUM. Do you think I could still do that with the sliced vanilla beans?? Good idea w/the vanilla sugar Fawn! Yeah, you can also use the sliced beans to make your vanilla sugar. Be sure to come back and let us know how this vanilla turns out for you. i made this today and it seems like i have a lot of tiny specks of vanilla bean at the bottom of the bottle and when i shake it, it’s everywhere!! should i not have cut the vanilla bean? i feel like that’s why it got ‘messy’. You’re fine Sherry, if you want to get the beans out before using you can filter it, but the internals of the vanilla bean are what give it the flavor, so you’re best to use it like it is. Hi Matt, this will probably sound like a dumb question but how many beans do I put in each bottle. The ingredients are 1 bottle of vodka but there are 4 in the photos. No worries Fiona, thanks for your question. I put approximately 12 beens in each bottle. can i put more vanilla beans in? right now i have a 1 cup solution going that has i believe 12 beans in it… we have not tried it yet but now i feel like i may have put to much in? That’s fine Landon, but you won’t extract all the flavor out of those beans so be sure to use them in another several batches. Awesome Fiona, glad you’re enjoying the site and finding it useful. I have been making this for the last year and think it it is best I’ve ever tasted. This puts even the Mexican pure vanilla extract I used to buy to shame. 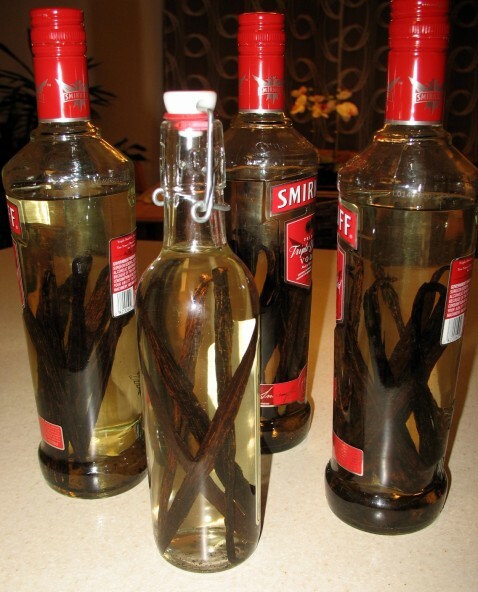 Try putting a few 1″ pieces of split vanilla beans into a small (16 oz.) container of sugar and you’ll have vanilla sugar to use in your cup of coffee or tea. It is yummy! This is great I never even considered that you could make your own vanilla extract! I go through so many of those little bottles a year! I’ve got the same vanilla beans you do Matt, although I didn’t end up using them for the original reason I purchased them for and they got dried out so I could not split them. I decided to just break them into 1″ pieces and stick it into the vodka that way. A few days later, I came to check on the bottle to see what was happening, the liquid was darkening and the vanilla beans had opened up like a straw…perfect 🙂 Also I got my vodka from Trader Joe’s for only $5.99 a bottle!!! Great price on Vodka! Yeah, the dehydrated beans should come back to life in the liquid. God bless Stephanie. This sounds awesome! I am gonna try it. Thank you! I have always wondered if this would work!! Thanks for sharing. Nothing better than “good vanilla extract” like the Barefoot Contessa always says. It also sounds like the beginnings for a great cocktail. Yeah, I’m sure it could produce some great vanilla vodka in little more than a day or two of extracting. I have a couple of questions. Do you use the same amount called for in a recipe? I’m just wondering if it is stronger than store bought vanilla. Also, at the end of 2-3 months when it is ready do you remove the beans? If they remain in the bottle does it continue to get stronger? Thanks. Hi Judy. Yes, just use the same amounts… after a few months the strength is the same as store bought vanilla. Just leave the beans in the bottle. When it gets low, add more vodka, the beans should produce good extract for up to 7 years! Ha ha, enjoy Chandra… it’s very easy. Have fun.